There were two best things about my mum’s endless stream of dinner parties. The first was that all the kids would always congregate on the stairs, giggling and laughing at the grown-ups’ conversation. The second was the leftovers. My sister and I would creep down the stairs and eat whatever escaped being devoured the night before – normally it was still on the dining room table. The best was my mum’s pavlova. It was crispy on the outside but deliciously soft and chewy in the middle, topped with strawberries and raspberries on cream. It always looks so impressive, but it’s really easy. I promise. Preheat the oven to 140C (275F), gas mark 1. Draw a 23 cm (9 inch) circle on non-stick baking paper as a guide and place on a baking tray. Whisk the egg whites with the salt in a large clean bowl, either by hand or with a hand-held electric mixer, until very stiff, then gradually whisk in the sugar. Whisk until it forms stiff peaks, this takes about 3 –4 minutes. Fold in the vanilla extract and vinegar. Spread the meringue mixture over the circle on the non-stick paper and bake in the preheated oven for 1 hour until firm. Mummy’s trick (which I always do and believe is the ‘key’ to a perfect meringue) was to turn off the oven and leave the meringue in with the door closed for another half an hour. Leave the meringue to cool and peel off the baking paper from the bottom with care. 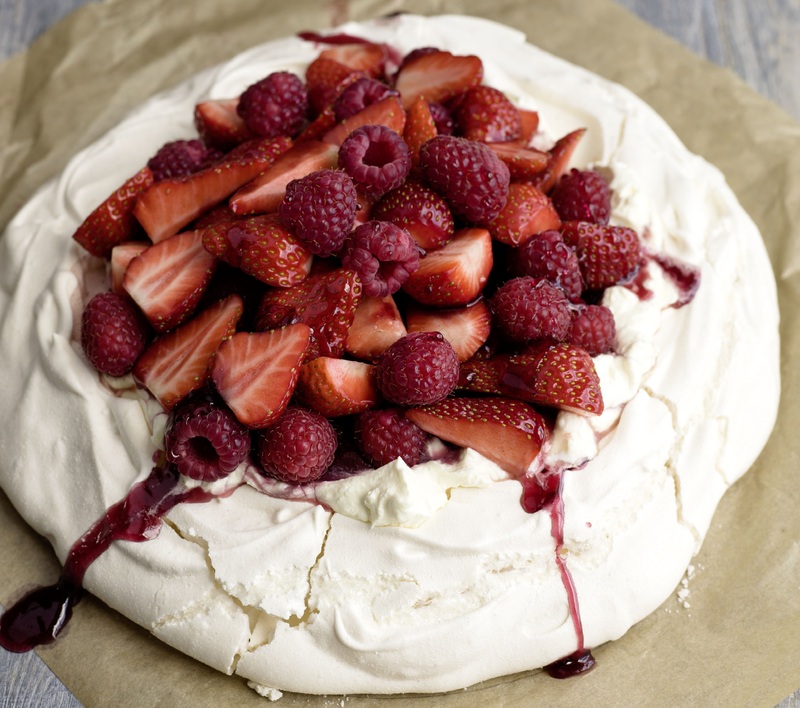 Place the pavlova on a serving plate. Whip the cream until stiff, pile on top of the meringue and decorate with the fruit. I strain the tinned raspberries and pile them in the centre, then arrange the rest of the fruit on the top. Of course, you can use whatever fruit is in season.